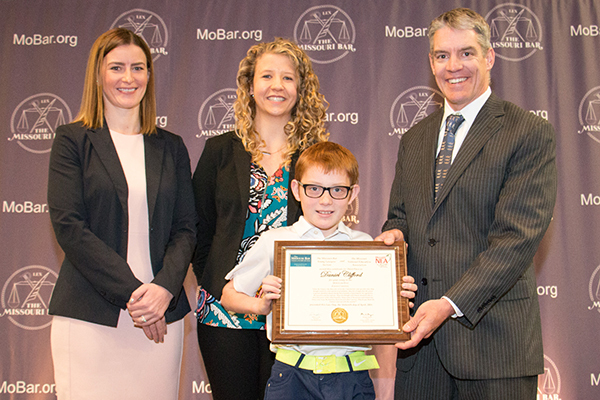 Two students in the PEGS (Program for Exceptionally Gifted Students) program at Remington Traditional School were selected as winners in the annual Law Day Essay Contest sponsored by the Missouri Bar Young Lawyers' Section and the Missouri National Education Association. Fifth-grader Audrey Dallape placed second and fourth-grader Daniel Clifford placed third in the fourth- and fifth-grade category. Dallape received a prize of $200 and Clifford received a prize of $150. Both received plaques at the Missouri Outstanding Citizenship and Law Day Awards ceremony April 16 at Capitol Plaza Hotel and Convention Center in Jefferson City. 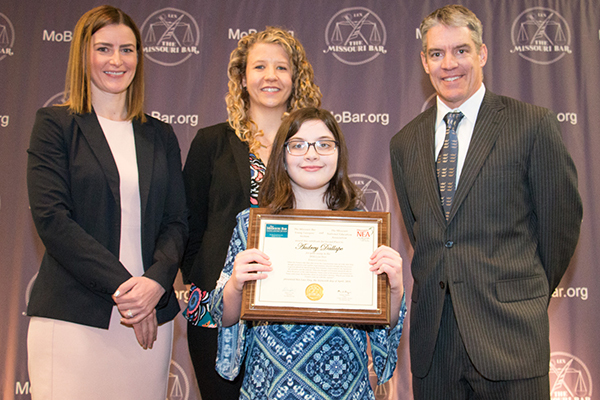 Missouri Bar Young Lawyers' Section Chairperson Morgan Murphy, Missouri NEA Board of Directors member Kristina Presley and Missouri Bar President Morry S. Cole are shown with Law Day Essay Contest winners Audrey Dallape (top photo) and Daniel Clifford (bottom photo).